This weekend we did some clearing out (almost qualifies as a spring clean). 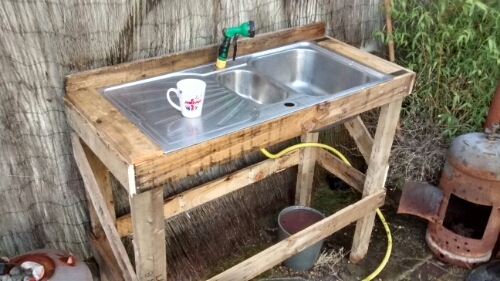 I also got round to splitting up some pallets and utilising an old sink to make a potting bench. 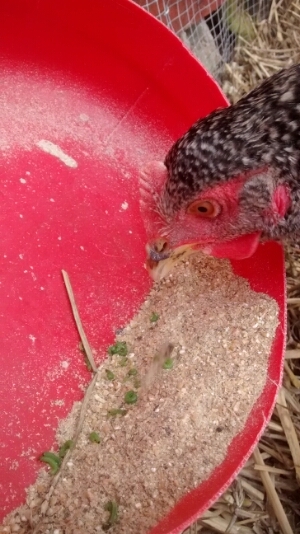 Among its regular tasks is somewhere to clean the chickens water bowl which is usually full of poo and straw 30 seconds after being put into their run. 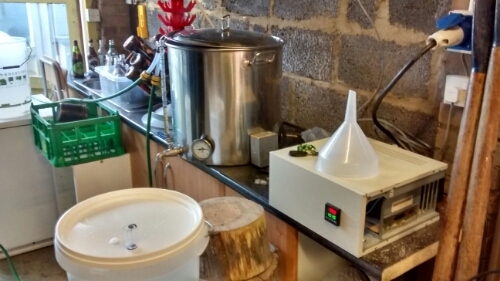 Another brew is on for the national home brew competition. 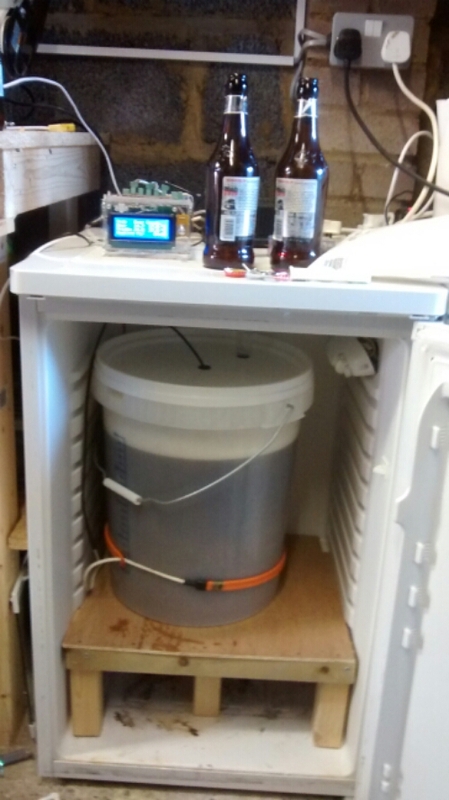 Gary made a stand for the fermenting fridge so that I don’t need to use an old log to keep stable. It’s build to bomb proof standards. And Ben was so cold he took the got seat. Actually he also ran electrical cable round the workshop to enable us to use the fridge without having to run extension cords everywhere. The advantage of it being winter now is that we can let the chickens freerange. This means the rhubarb is gone. Completely. They really like rhubarb. Next to go is the comfrey (my bocking 14 variety) which is in the process of being decimated. 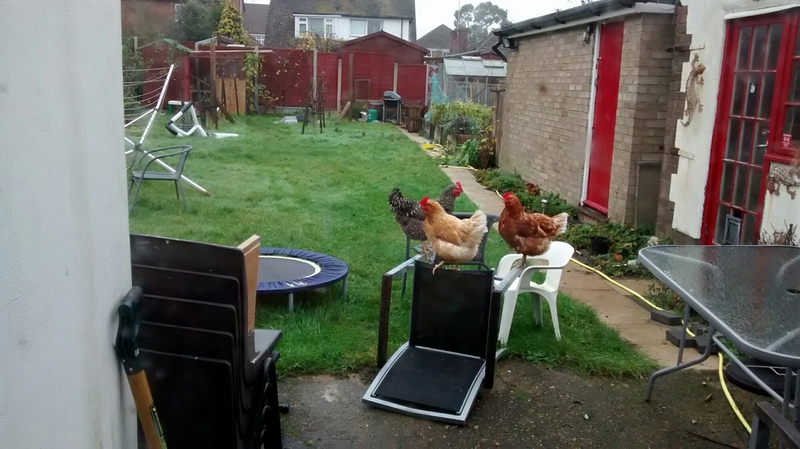 Apparently even the garden furniture is fair game (as below). 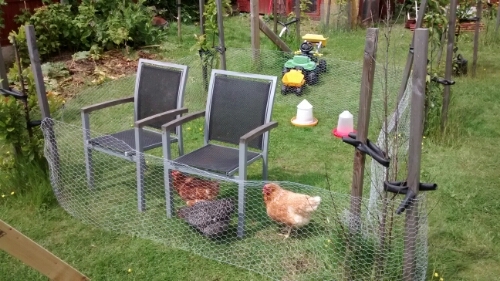 Using the tree posts, I half arsed together a temporary enclosure for the birds. The can range in a restricted nature rather than destroy our rhubarb, strawberries, gooseberries, fruit trees, grapes, raspberries etc. 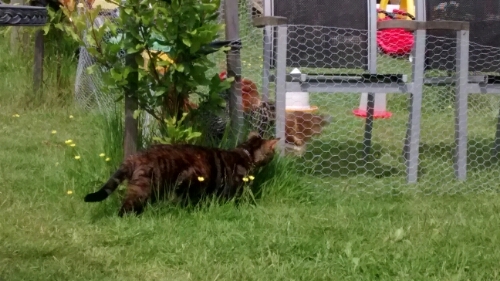 Neither our cats not the birds have worked out how to enter/escape. 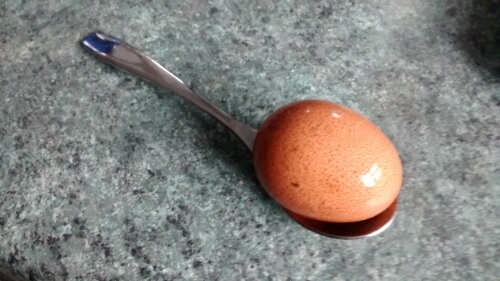 Tea spoon for scale. Yes its tiny! Who’s the prettiest chicken of them all? Yes yet again we have gooseberry sawfly. We have some natural defenders – Piri Piri has stepped up to the challenge! 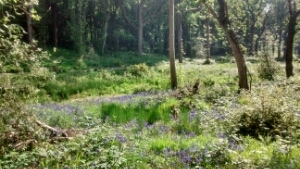 Took a walk with Sam today to see the bluebells. 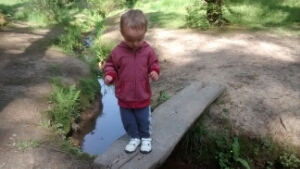 And to play chase chase (Sam’s current favourite game) and play pooh sticks in the stream. I won. Sam didn’t seem bothered. Up top and darker is Jalfrezi, below is Korma. And Piri Piri, previously the bottom of the pecking order is now at the top! 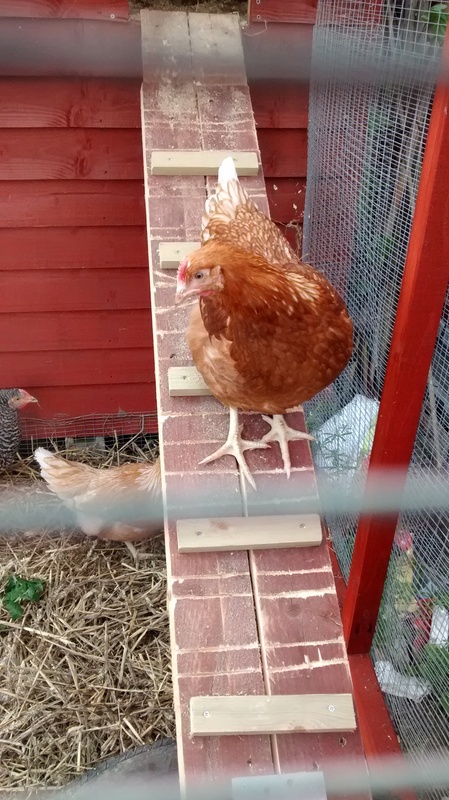 All the girls are loving the ramp and the open area outside. 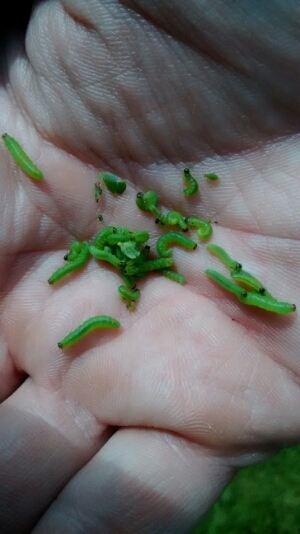 They also eat bind weed! Score! 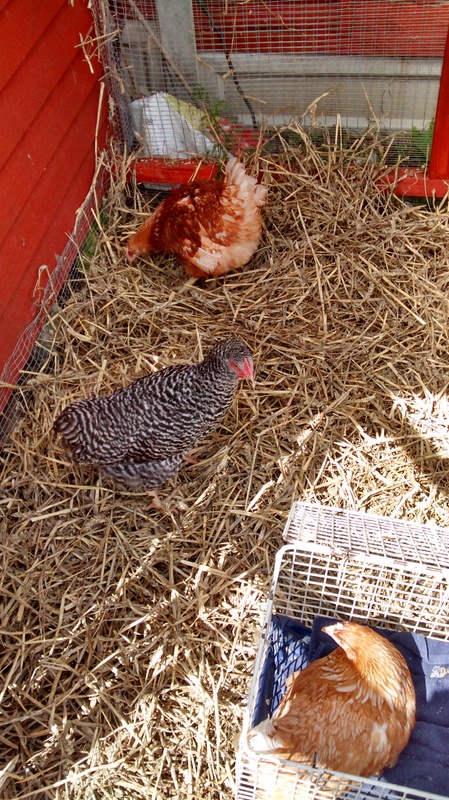 So, after several years of wanting chickens, here we finally are! 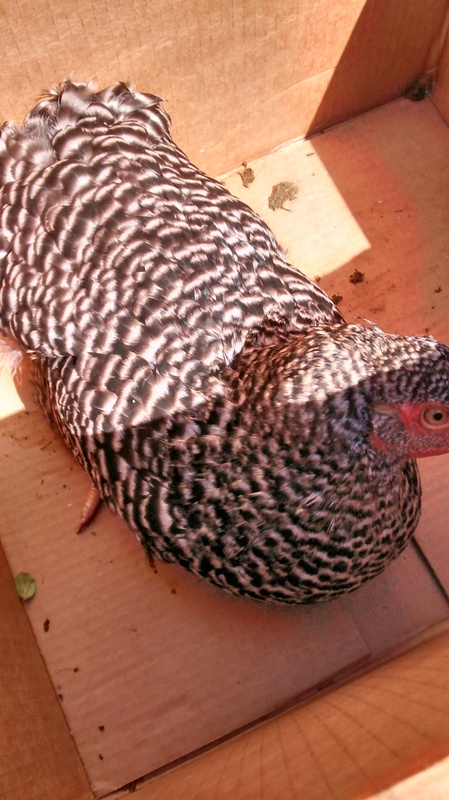 A few days ago I was contacted about a chicken that someone had tried to introduce to an existing flock that had been badly beaten up. 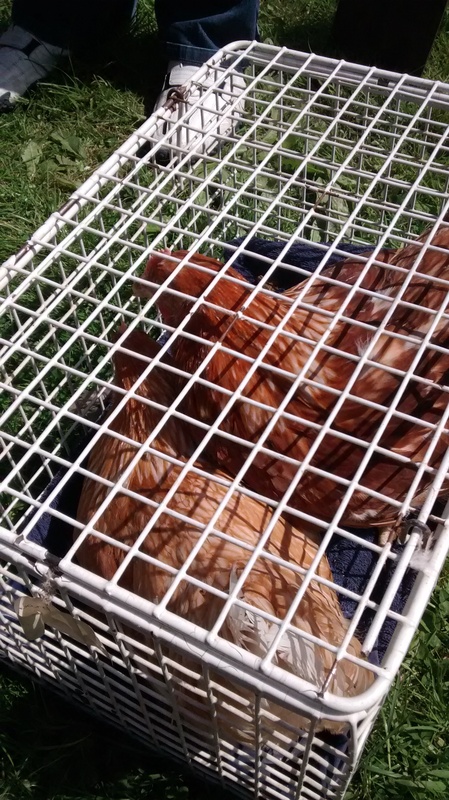 This isn’t unusual when introducing chickens into existing flocks and luckily I have a large hen house with no chickens in it. It has moved up my schedule a few weeks which means we’ve got a bit of rush on to finish the coop, but nothing to worry about really. 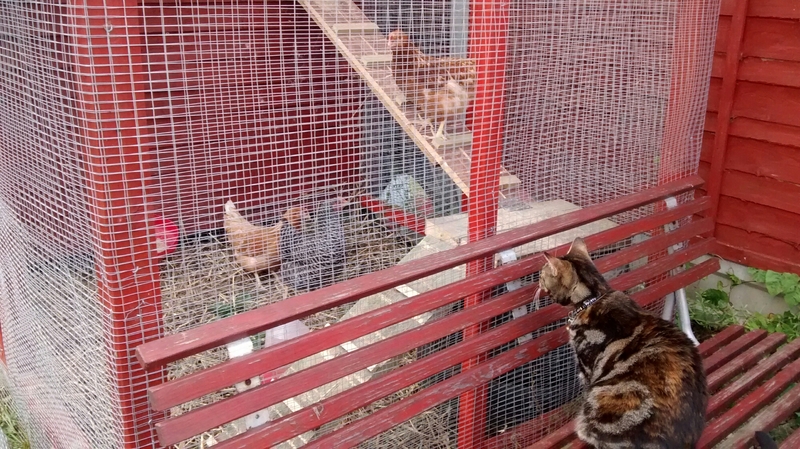 The reason for moving the date up is that chicken integration works best by putting them all in unfamiliar territories at once. Also, woop, free chicken! 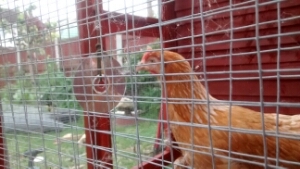 Though saying that, I’ve also got two more being bought from a commercial supplier in Chelmsford – at £6 each (POL – Point Of Lay) which I’ve got to pick up on Saturday as well as the coop modifications. 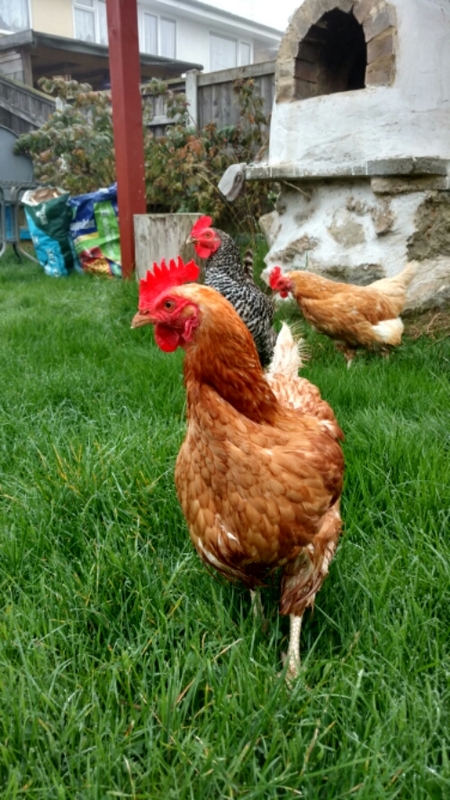 Look forward to some chicken updates in the next few days! After about 7 years of wanting chickens, I finally got one step closer. 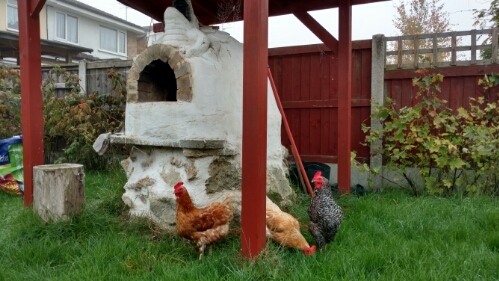 We’d already decided to dedicate the old allotment shed into a chicken house and had put in some supporting posts for the run last year. I got up early on Sunday hoping to make a start however quickly realised I didn’t have any hinges and the shops shut at 1pm, so I took Sam for a ride down to the timber/hardware store to pick some up. When I got back, it was already at midday. By the end of the day I’d managed to get the basic frame up and the door. 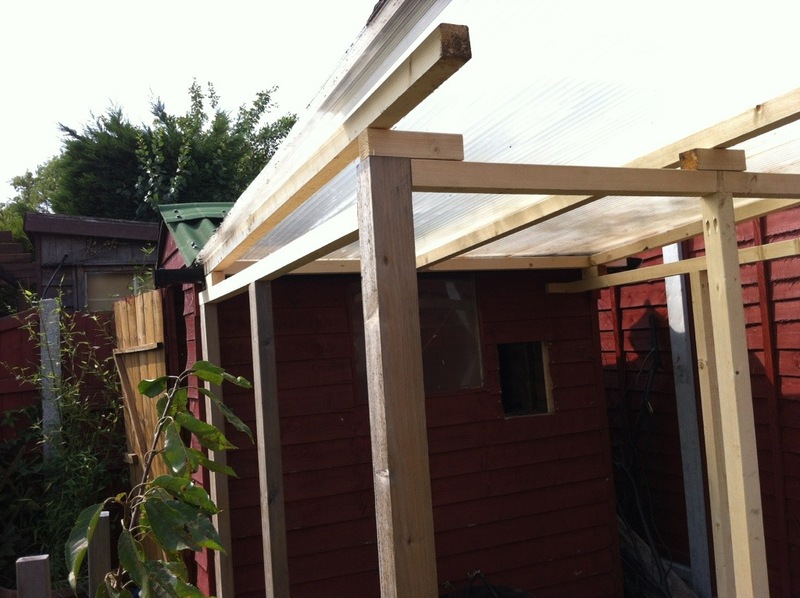 The roof is made out of 5 core polycarbonate. 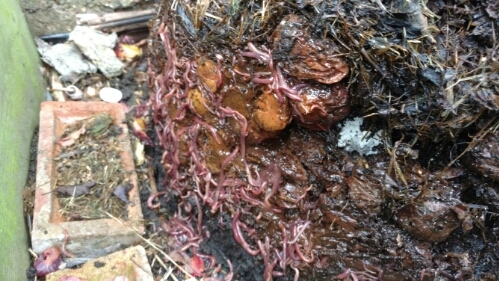 It’s a conservatory grade insulating roof. Why such a lavish roof? Well, when my roof started leaking last year and this had mould inside the cores, I decided to replace it and had this spare. It fits perfectly and has a little bit of an overhang which I’ve not yet decided whether I’ll keep or chop it off. Either which way, I’m sure the cats will enjoy sunbathing up there and similarly the foxes won’t find it easy to get in being that it’s so solid. On Monday, again, it was a slow start. I’d decided to have a relaxed evening, so we popped out and bought some pork belly, german wheat beer and raspberries (for ice cream). 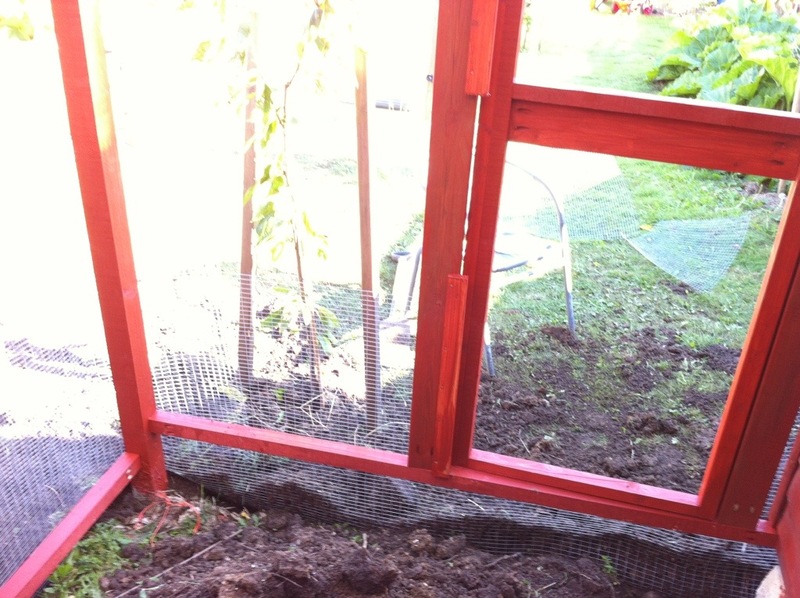 We were back about midday and I got on with painting the frame with a couple of coats of fence treatment. 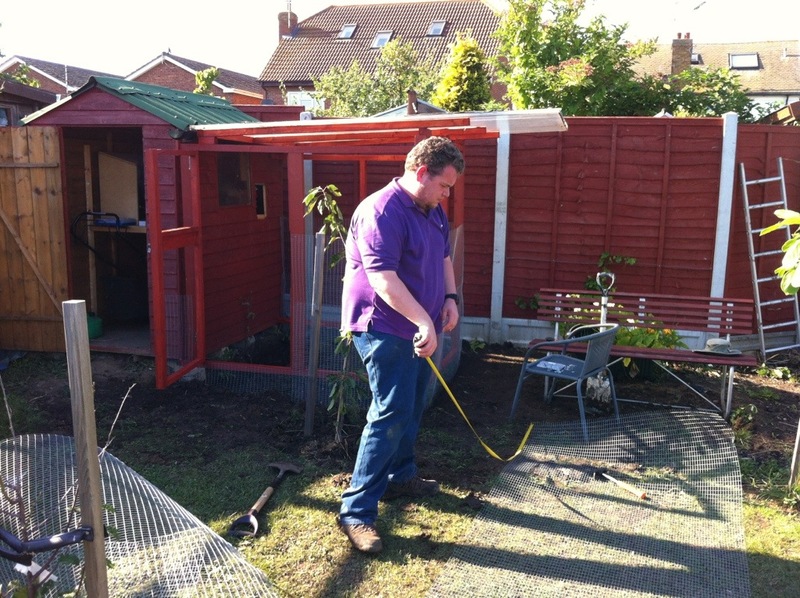 By about 1:30 we started the task of digging the shallow trenches to lay the mesh in. We followed up by laying the mesh and stapling it to the frame. I bought the entire 30m roll from Hills of Devon (http://www.hillsofdevon.co.uk/) – A16 on their site which is 1/2″ x 1″ x 48″ x 30m (bit of an odd mix of measurements, but there you go. It’s 1mm thick, or 19 gauge in old money – I would have preferred 1.6mm/16 gauge, but it’s not available in the mesh size and length I wanted. 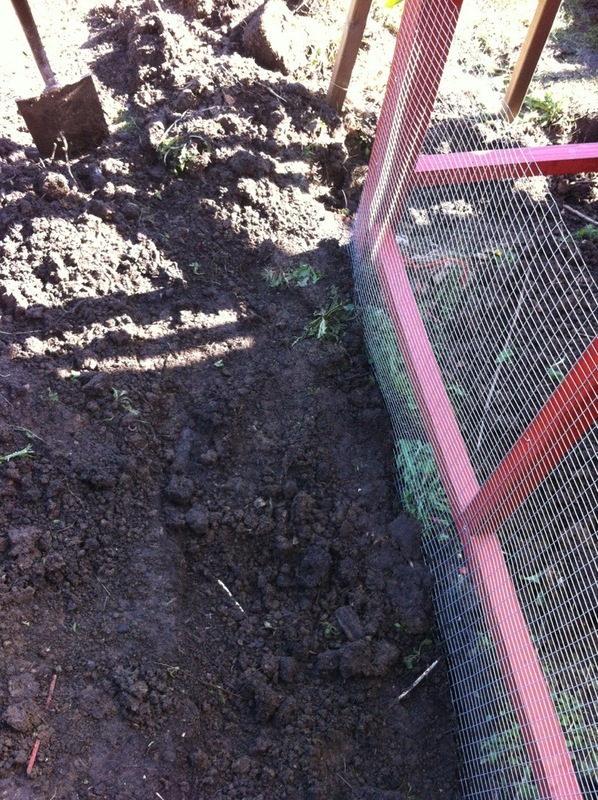 I didn’t use chicken wire because foxes can tear through it with their teeth if they gain purchase on it. Welded mesh is tougher when it’s pulled because instead of being twisted in place (and therefore can stretch) each point is welded meaning if one link goes, the rest should hold fast. 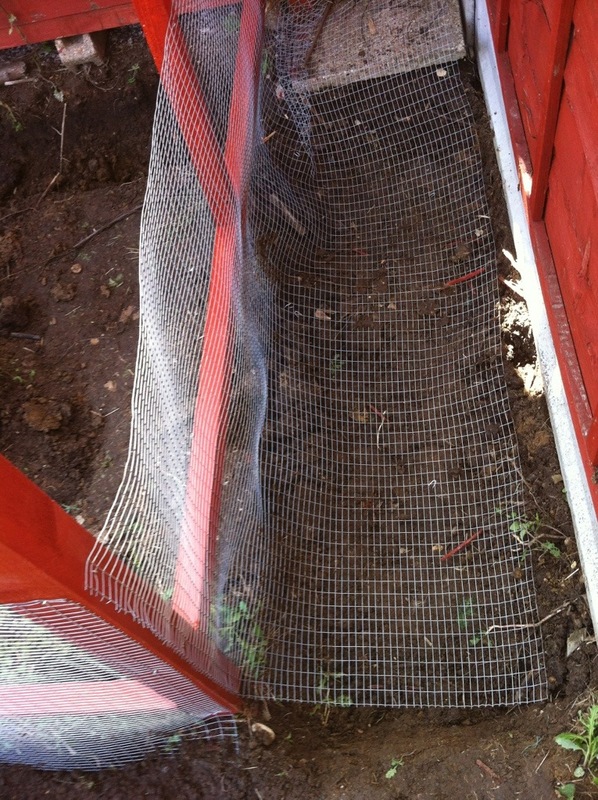 We laid it flat under the soil because foxes generally tend to dig by the mesh, not having the brains to start digging a foot or two back to dig under the metal. You don’t need to bury it, you can leave it on top of the grass and just let the lawn grow through. For aesthetics and to stop small babies playing with sharp ends of wire, I buried ours. You can see the above buried. Inside view of the door. We decided to do the bottom panels out of individual sheets of metal. For the 2nd and 3rd layers we used a continuous sheet 170″ long. The wire runs right up to the top to stop wild birds getting in. Because we used three layers we got quite a lot of overlap. The middle and lower almost have double all the way round. 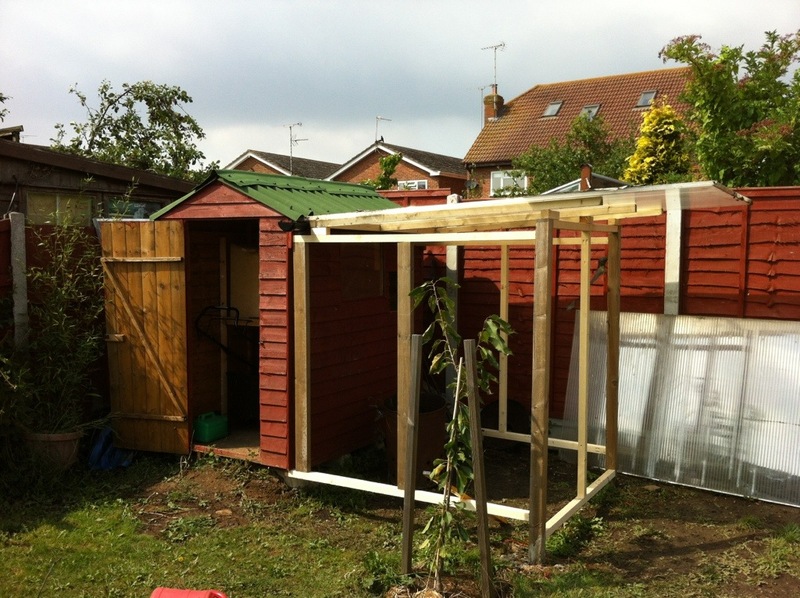 I still need to lay more down from the shed into the ground to stop things tunnelling in and do the door (and bit above) as well as the inside of the shed as it’s partitioned to put the mower away. 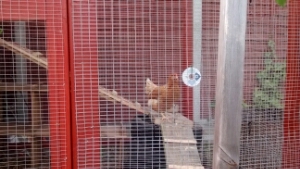 Arduino powered chicken coop pop door! 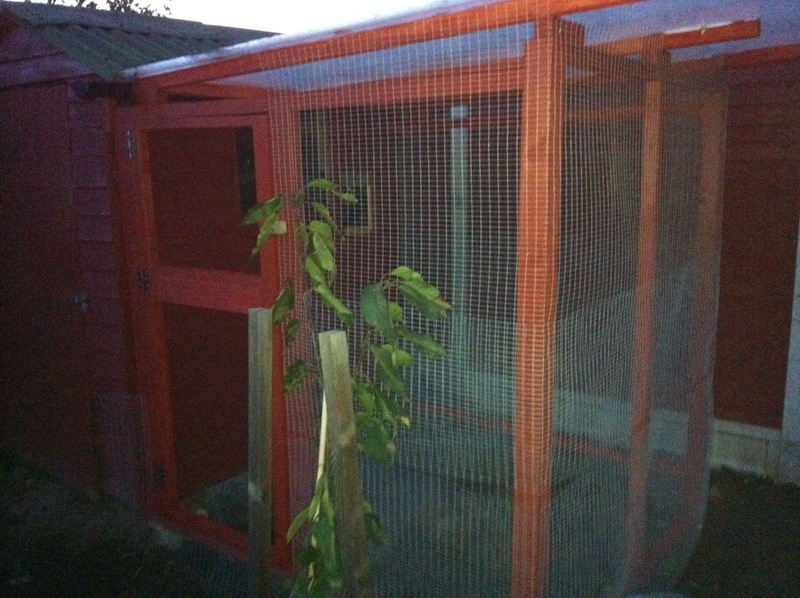 On Thursday, I saw a really cool idea on ebay, an automated chicken pop door. £85 though was not for the faint hearted. My friend Gary had some motors, but no knowledge how to do the timing circuits. My friend Ben however had that sort of stuff sorted. 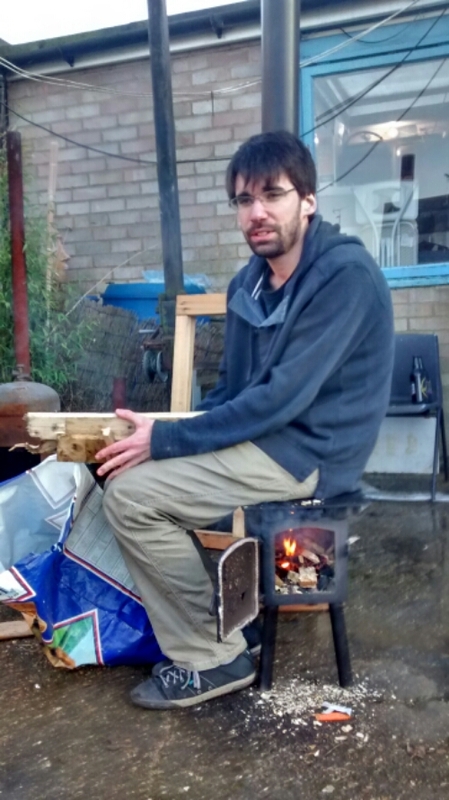 He’d been to a google conference and given an Arduino. With a little technical know how and lots of electrical tape, an idea was born. The door was 2×2 routed with a small hole for sliding. Pulleys made light work of the weight so a small servo motor could be attached. You do need a continuous rotation servo though. It works wonderfully. Total cost, about £50. So it’s a saving. Not including the wood and pulleys, but the £80 door wouldn’t have included those either.